Four decades ago, I was immersed in baptism at a Southern Baptist church. At about the same time, the Southern Baptist Convention was passing a resolution that will shock you just as it shocks me. Today, the red line that religious conservatives have drawn most firmly is the line against abortion rights. Many evangelicals, including myself at one point, would not even consider voting for a candidate who was pro-choice. Abortion is murder. What could be more obvious? And for what does government exist if not to prevent the murder of its most vulnerable subjects? So imagine my surprise when I recently learned that the evangelical consensus just one generation ago was pro-choice, not pro-life! The most surprising piece of history for me was the 1971 Resolution of my own Southern Baptist Convention (SBC). Keep in mind that this was a resolution adopted after much prayer, listening for God’s Spirit, etc., as such resolutions always are. This is what the Southern Baptists felt God was leading them to proclaim. Did you catch that? The Southern Baptists just 41 years ago urged their members to work for pro-choice legislation, even allowing for abortion in the case of likely “emotional damage” to the mother (i.e., if having the baby would be just too stressful). That’s pretty darn close to abortion on demand. They have since repudiated that position. You can trace the evolution of their position in the series of resolutions that are assembled here or on the SBC’s own Website here. I’m not here to argue about abortion, or even about religion. I just want to share my emotional reaction when I learned that my own conservative denomination once proclaimed that God had led them to say the opposite of what he supposedly leads them to say today. It’s a lead-in to the post I promised on why I left evangelical Christianity. [Edited to add:] Second, I felt surprise that I evidently had still been getting moral guidance from evangelical Christianity. I thought I had let go of that after my study of slavery in the Bible and evangelicals’ excuses for it. I felt a little sad as the last thread broke. Or at least I think it’s the last thread. The third feeling was a little indignation that evangelical pastors have not been forthcoming about the profound shift in the evangelical position on this issue. If they had been, then their congregations (a.k.a. voters) would be more humble and maybe the country would be less polarized. Fourth, it became more clear than ever that we cannot count on God to grant prayers for wisdom, even when we think he has. How could God lead one Bible-believing, God-honoring, prayer-filled group of Southern Baptists in 1971 to call on their members to “work for legislation that will allow the possibility of abortion” in the case of “emotional damage” to the mother, and then lead another prayerful group in 2003 to “lament and renounce statements and actions by previous Conventions and previous denominational leadership that offered support to the abortion culture”? And what prayer would God answer if not a prayer for a wisdom about protecting innocent, human life? In fact, the Bible promises that God will answer such prayers generously. This is a special case of the inefficacy of prayer, which is one of the reasons I left evangelical Christianity. More on that in my next post. On Friday, I visited the wonderful Hill-Stead Museum in Farmington, Connecticut, where I saw Dancers in Pink by Degas. The docent told us that these girls were poor, and were selected more for their looks than for their talent. They were not the main attraction, but would perform during the intermission at the opera. As you can see, one of them wears an earring. The earring signified that its wearer had a patron — someone who had promised to take care of her and her family for the rest of her life. “For the rest of her life, or for the rest of his life?” one of my fellow tour-takers asked. “Good point. For the rest of his life,” replied the docent, a sweet woman in her seventies. “Yes, that’s right,” the docent finally disclosed. All at once, I saw two things. The first was that poverty brings with it many ills and humiliations beyond being poor. One can imagine a poor family with a beautiful daughter. It fell to her to sell her very person to support her family. You can write the script from there — her degradation; the devaluing of her own marriage, if she were fortunate enough to have one; her worries for her children; her feeling of being forever trapped. Dancing girls looking for “patrons” no longer vie for the attention of wealthy men during the intermissions of operas. However, plenty of women resort to prostitution, or simply live with abusive, unstable boyfriends because they feel they have no better option. I call on those who loudly care about morality (I’m looking at you, Religious Right) to work to structure society so as few women as possible face these impossible choices. I readily agree that we cannot solve the problem by throwing government money at the symptoms. We have tried that by giving money to women who have out-of-wedlock births, and — surprise — the out-of-wedlock birthrate has gone up, not down. What will work? I’m not sure, but I do know one thing: the people least likely to find the solution are the powerful, white males who have both promoted and benefited from the inequalities of power and wealth for all of Western history. That brings me to the second thing. I felt another reason to rejoice in President Obama’s reelection victory. He won with a coalition of the relatively powerless: young people, African-Americans, Hispanics, homosexuals, secularists — and women. Romney’s base of older, white, evangelical men are no longer enough to carry the day. They still have plenty of power, but they don’t have the monopoly they once had. With Obama’s reelection, all segments of society are seated firmly at the table, so we are more likely to find solutions to some of our most vexing problems. No segment will write the rules for everyone else. 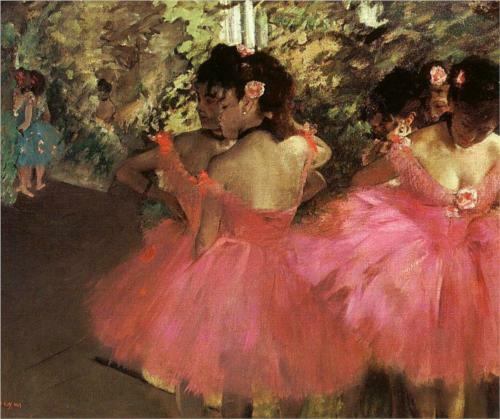 Powerful males wrote the rules of Degas’ society. The dancers were ruled for the pleasure of men. I’m glad we have given ourselves a chance to get past that.